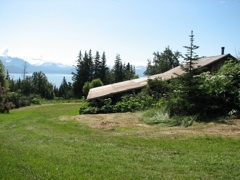 In the early 1940’s Yule Kilcher and his bride Ruth came to Alaska from Switzerland to start a new life in Homer, on the shores of Kachemak Bay. They first lived with their 3 little girls in a tiny one room Fox Farmer’s cabin on the 160 acres they had purchased far out in the wilderness, without electricity or modern conveniences. During that time they farmed and cleared land for crops and logged the trees for their new log house with only a team of horses, and hand tools. After many years they obtained more land via the Homestead Act and raised their large family of 8 children in the log house that Yule and Ruth had built by hand. Our family lived the subsistence lifestyle, gathering wild greens, hunting moose and catching salmon for food and growing a large garden. Because there were no roads, and only the beach to travel the 12 miles to town, the children were all first home schooled. Ruth also washed clothes by hand, sewed on the treadle sewing machine, taught the children folks songs, canned fish, milked the cow, made cheese and butter, chopped wood, and read us bed time stories by the light of the kerosene lamp. Yule and Ruth made a documentary of their pioneer lifestyle which they showed all over Europe, making the homestead and Alaska well known around the world. In 1955 Yule became one of the 55 delegates to help write the constitution for the new state of Alaska. Around the cabin can be seen the old photographs, and old utensils, schoolbooks, lamps, and farm implements that our family used for many years in our early day to day lives on the Homestead. 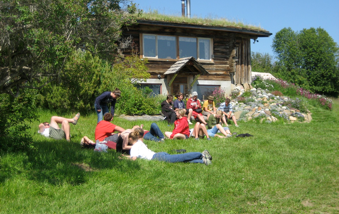 By making the cabin and the land available for non profit , educational, artistic and agricultural activities, the family is continuing the legacy of Yule and Ruth who shared their unique life and vision with visitors from near and far. Over the years their public service to their community and state served as an inspiration to others to make a difference in the world. THE CABIN IS AVAILABLE FOR SELECTED GUESTS WHO WANT TO EXPERIENCE THE NIGHT IN AN AUTHENTIC PIONEER LOG CABIN , ALONG WITH A HOMESTEAD STYLE BREAKFAST COOKED ON THE ORIGINAL COAL STOVE JUST LIKE IN THE PIONEER DAYS.